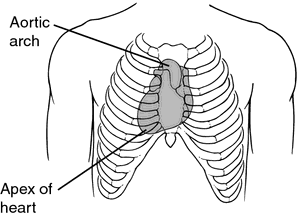 location of the heart in the right side of the thorax, the apex pointing to the right. See illustration. mirror-image dextrocardia location of the heart in the right side of the chest, the atria being transposed and the right ventricle lying anteriorly and to the left of the left ventricle. Displacement of the heart to the right, either as dextroposition, with simple displacement to the right, or as cardiac heterotaxia, with complete transposition of the right and left chambers, resulting in a heart that is the mirror image of a normal heart. /dex·tro·car·dia/ (-kahr´de-ah) location of the heart in the right side of the thorax, the apex pointing to the right. isolated dextrocardia mirror-image transposition of the heart without accompanying alteration of the abdominal viscera. mirror-image dextrocardia location of the heart in the right side of the chest, the atria being transposed and the right ventricle lying anteriorly and left of the left ventricle. the location of the heart in the right hemithorax, either as a result of displacement by disease or as a congenital defect. A heart misplaced in the right chest, with the apex of the heart pointing right; the cardiac function is normal if there is concomitant situs inversus of the abdominal organs–mirror-image dextrocardia; if the dextrocardia is due to immotile cilia, sinusitis and bronchiectasis–Kartagener syndrome may also be present EKG Mirror-image electrical activity with P, QRS, and T waves in leads I, aVR, aVL that are the reverse of the normal; the right activity resembles that normally seen in the left side of the chest; if the abdominal organs are not reversed, dextrocardia may be associated with ventricular inversion, single-chamber ventricle, pulmonary valve stenosis and anomalies of venous return. See Kartagener's syndrome. Cf Dextroposition of the heart. The congenital anomaly in which the apex of the heart points to the right instead of the left. Dextrocardia is often associated with a similar mirror-image reversal of the abdominal organs. location of the heart in the right side of the thorax, the apex pointing to the right. location of the heart in the right side of the chest, the atria being transposed and the right ventricle lying anteriorly and to the left of the left ventricle.